I once had a friend say she felt like she was putting on prison fatigues every morning when she got dressed for work. The day was a heavy weight on her, from the time she got up until she attained "freedom" at the end of the day when she could finally go home and do "what mattered." If you feel this way, then this book is for you. 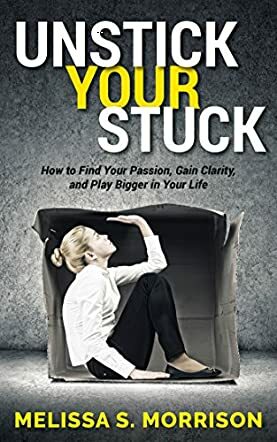 Unstick Your Stuck: How to Find Passion, Gain Clarity, and Play Bigger in Your Life by Melissa Morrison tells you how to break free from the prison of falsehood to find your true passion and pursue a fruitful life that feels more like a party than a sentence from graduation to retirement. Morrison uses the story of how her brain injury forced her to reevaluate her life and purpose to take readers on their own journey of self discovery and authenticity through her S.O.A.R.I.N.G. program. It's an effective program built through her life coaching skills that show you the light of who you are, and what you should be doing with your life. Unstick Your Stuck: How to Find Passion, Gain Clarity, and Play Bigger in Your Life is an excellent book that gives readers the courage and motivation to look within, break free of the chains of fear, and find a purpose that has you looking forward to your work. Too many of us settle into careers based on expectations of others or security, which is really a whitewash for fear. Melissa Morrison breaks through that fear by guiding readers through the process of self discovery and manageable steps to take you from the life you have to the life you want. You learn that there really are greater possibilities, and that it can be done as you parallel her journey from a career in finance to becoming a life coach with passion and purpose. Unstick Your Stuck is an outstanding read that can help you discover the life you want, and give you the courage to pursue it. An inspiring and motivational read!